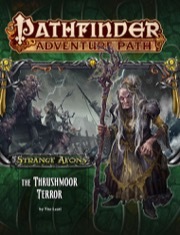 "The Thrushmoor Terror" is sanctioned for use in Pathfinder Society Organized Play. The rules for running this Adventure Path and Chronicle sheet are available as a free download (723 kb zip/PDF). Overall, I really like this installment of the Strange Aeons AP. It's a very well-crafted mystery adventure. I only gave it 4 stars instead of 5, as the flow of information needs a little adjustment. However, there are are excellent ideas on the forums, and the preparation time needed to make the proper changes is very small. Review from a player's perspective. I am currently playing through this module with a group of experienced players and an experienced gm. Our gm doesn't like to pull punches and likes to have the group figure things out. 6 session in and I still don't really know where we should be going. We are undergeared and under level for many of the encounters we have run in to. We have experienced several character deaths because of this which has ruined the experience for me because I can no longer take the story seriously. The gm is also pulling punches which also spoils the game for me because I feel no accomplishment. The characters who perished were investigative types who are being replaced more combat optimized characters. Yet another blow to the mood of a lovecraftian horror game. I hope this book is just a hiccup because the first book was really amazing. The maps are all interesting enough, yet easy to draw for a GM. Lots of Sandbox style roleplay possible, with roughly a dozen NPCs. Very diverse enemies, some of them quite deadly, which is ok for a Cthulhu campaign. The "Star Stelae", Muscaria drug and "Confabulation plates" wondrous item. The Hastur article is pretty interesting (but i expect it to be built upon in the finale of AP#114). The use of Skum is both illogical and underwhelming. They are creatures of the Aboleths, which fight the Great Old Ones. It should be Deep Ones instead. The Trushmoor gazetteer is underdeveloped, with the locations getting less than 3 pages. The art for the Byakhee could be better. UGLY: Either ignore the "surreptitiously cast" comment on page 37 or give the creature the "Deceitful" and "Conceal Spell" feats. 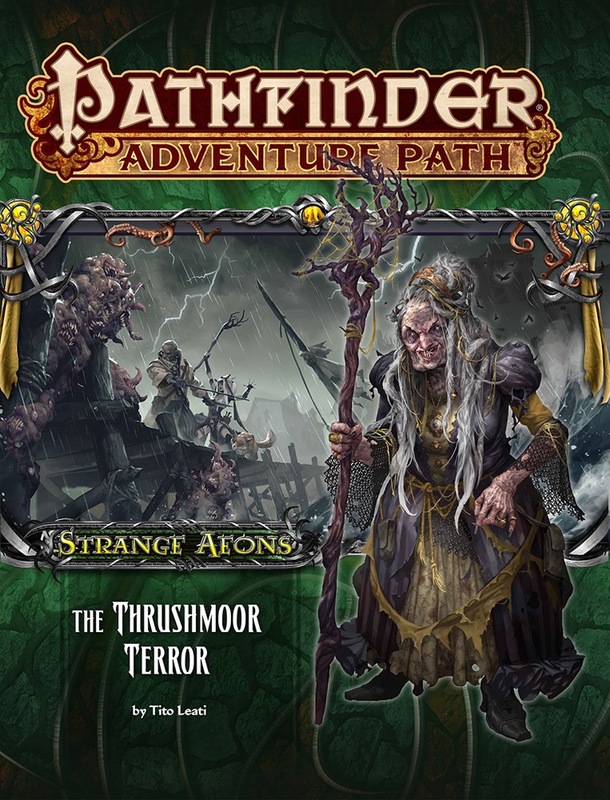 A solid follow-up to the superb "In Search of Sanity", "The Trushmoor Terror" begins like a normal Pathfinder adventure and only in the last part adds Mythos creatures to the mix. It´s a good slow buildup, but doesn´t quite achieve the horror-athmosphere of the first book. I love Lovecraft and I wanted to love this adventure. Indeed, there are many reasons to do just that. First off, I'm thrilled that the weird little town of Thrushmoor is finally explored in depth, and in that regard, I was not disappointed. The place drips with isolated, superstitious, almost claustrophobic weirdness, and though the townsfolk are not outright hostile, they have some mixed feelings about the player characters. Justifiably so, it turns out. After exploring the town a bit, the PCs are supposed to head to the local fort that doubles as Thrushmoor's center of government. Ft. Hailcourse has some fun encounters, with the highlights being a shapeshifting mirror creature and a couple skum with class levels. The adventure culminates with a visit to Iris Hill, the former abode of none other than the insidious Count Haserton Lowls IV. This was my favorite part of the adventure, with Mythos beasties and cultists galore. This could have easily been a 4-star or even 5-star adventure. However, I think there were some major missteps in its execution. The biggest issue is the order in which the PCs are meant to tackle the set pieces. They have a choice between Ft. Hailcourse and Iris Hill, and due to the respective difficulty levels of these two locales, they really need to hit the Fort first. Alas, from a PC's perspective, I think Iris Hill is a much more reasonable target. There are no imposing walls, multiple points of ingress, and a doorman who is shady at best. Contrast this with Ft. Hailcourse and its single point of entry, which is guarded by a shapechanger with a very believable alibi and a solid Bluff check. To be fair, the author suggests that a helpful NPC guide the characters to the Fort first, but I don't think this is quite enough. At all. Another issue is the unexplained disappearance of the town's high priestess, as compared to other important missing NPCs whose fates are fully detailed. Additionally, as brought up in a post from johnnyzcake, there's the fact that the PCs are supposed to collect a wide range of books in Iris Hill for the next adventure. Most of these can be found in one room, though not all of them. The author's explanation for why the characters should know to pick up these tomes, is because they happen to have titles. That's it. That's the only reason. And while I say the party is "supposed to collect" these books, based on what I read, it looks like the party needs all of them for the next adventure. Granted I haven't yet read that adventure yet and may be mistaken, but if I am not, this is a big problem. None of these problems make The Thrushmoor Terror unplayable. Not by a long shot. With that said, it looks like a GM is going to need to make a few significant tweaks to run it smoothly. Even with these problems though, it manages to be a cool adventure. Aside from the adventure itself, there's the ubiquitous Bestiary, a rundown on Hastur and his cult, and a close look at Thrushmoor itself. I was quite pleased with all three of these supplements. No complaints spring to mind. Announced for September! Product image and description are provisional and subject to change, though the image is close to final. Spooky hag and a gibberish mother horde - wonder if that's Pier 19? Iconic number three is, unsurprisingly, Quinn. The art on those gibbering mouthers is amazing. Also, Quinn's first AP! Huzzah! Someone has a keen eye and some lore about Thrushmoor. Yep! One of my favorite spots in Thrushmoor. Wondering if Lowls and his mysterious aides will be involved - rewriting him as an occultism would be fitting. I'm liking the trend of having the announcement covers being much closer to the release covers - is this just a fluke thing, or is this the new standard? And considering that we have a Hastur article in this book, I think I know what the theme song of this AP should be. Per the cover image, Tito Leati is the adventure's author? Isn't Thrushmoor detailed in Rule of Fear? Haserton Lowls IV is neutal evil and Aristocrat 2/Bard 2. Immediately saw that. Now can't stop looking at it. It's mocking me. yep. Hence my comment on retconing him as an occultist: works with his flavor. Careful, do not speak his name you foolish man. What type of witch do you think that is? Another hag? So is this the Thrushmoor Terror or Thrushmoor Manor? It's listed as the latter here. It is indeed The Thrushmoor Terror. Cool! I love the art AND the fact we're getting a gaz of Thrushmoor. I wanted more details. Remind me were Thrushmoor is located? In Ustalav on Lake Encarthan. Ustalav! The place you go when you want that grey, rainy and slightly weird vampire vacation. In other news, I wonder if we'll get sections of the stuff from Chambers or by Bierce in terms of using some of that as a way to describe Hastur's rites and stuff. In fact, Chambers and Bierce and Derleth and Petersen are much more responsible for setting up what gamers regard as the "Hastur Mythology" today. Lovecraft's actual contribution to Hastur is in fact miniscule; he mentioned the name once or twice but that's about it. So yes, what we do with Hastur in Pathfinder is MUCH more inspired by what's been done with him via Chambers, Bierce, Derleth, and Petersen, along with a SIGNIFICANT dose of my own exploration of Hastur themes. Interesting that three sailors are noted to have "melted" on Pier 19, and there are three gibbering mouthers on the cover. In Lovecraft country, melting doesn't guarantee the mercy of death. It doesn't mean they became monsters either. Unless they're from Illmarsh. Then we all know what happens. Removed off-topic posts and their responses. Keep this thread about the product, please. Also I wonder about the page count on Hastur's religion/cult. Finally, will all the AP have new Great Old One in it? !